For guides, teams of guides, and people who find themselves paddling with others who rely on them for safety and decisions. 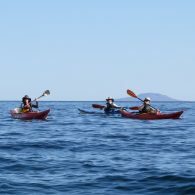 In accordance with British Canoeing certifications, offer a sheltered water course called Paddlesports Leader and a sea course called Sea Kayak Leader. We schedule these courses about once a year, and are happy to schedule custom courses for groups of 4-8. An accessible new course that applies to various watercraft in sheltered water. 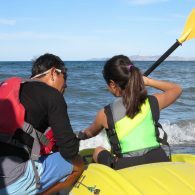 Valuable for day guides, parents of kids who love to play in the water, and people who go paddling with less experienced friends. Improve your ability to keep others safe on the water-it’s a super investment! If you are competent in safety, leadership, personal skills, and can demonstrate good decision-making in the upper levels of remit, (half a knot of current and winds to force 3), join us for an assessment and get certified! 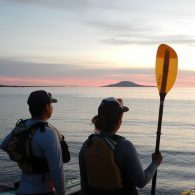 Sea Leader Training delivers the personal skill and leadership ability required to lead a group of paddlers on single or multi-day journeys in an environment of moderate tidal water. Accredited by British Canoeing as official training for Sea Kayak Leader.